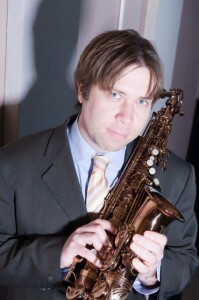 Zoho Music recording artist Travis Sullivan has earned a worldwide reputation as an alto saxophonist, pianist, composer, and arranger that has been embedded in the New York music scene for the past 20 years. In 2002, his breakthrough came in the form of Travis Sullivan’s Bjorkestra, an 18-piece big band performing his arrangements of the renowned music of Icelandic pop goddess Bjork. The Bjorkestra has acquired international recognition from performances with acclaimed jazz artists such as Dave Douglas, Kurt Rosenwinkel, and Donny McCaslin, and performances at the Montreal International Jazz Festival, the SF Jazz Festival, and the NYC Winter Jazz Festival. The Bjorkestra has released two CD’s: I Go Humble (2013, Zoho Music) and Enjoy! (2008, Koch Records). Sullivan’s 2011 CD release “New Directions,” was his his debut on Posi-Tone Records, and presents eight of his original modern jazz compositions and quartet, as well as Rodgers & Hart’s “Spring is Here,” and his arrangement of the Tears for Fears classic “Everybody Wants to Rule the World.” In 1999 Sullivan’s self-release Travis Sullivan’s Project One: As We Speak featured his original music with a quartet that included guitarist Rez Abbasi and drummer Ari Honig. Travis has also performed and/or recorded with Phil Woods, Ambrose Akinmusire, George Garzone, Dan Weiss, Clarence Penn, Rachel Z, Avishai Cohen, Anat Cohen, Nir Felder, Donny McCaslin, Becca Stevens, Alan Ferber, Jane Monheit, Clark Terry, Jason Miles, and Lukas Ligeti. He can be heard performing regularly in the U.S. at venues such as The Blue Note, Iridium, The Jazz Standard, and Joe’s Pub. He has also appeared internationally at The Jarasum Jazz Festival (South Korea), and Aperitivo in Concerto (Italy), and as conductor for the Cologne Contemporary Jazz Orchestra (Germany), the Sicilian Jazz Orchestra (Italy), the Reykjavik Big Band (Iceland), and the Bohuslan Big Band (Sweden).